Designing and building your model railroad benchwork should be fairly straightforward once you have a pretty good general idea about your theme and trackplan. As always, you should have a plan in mind before you proceed. You will need to keep your trackplan in front of you as you design your benchwork. If you have carefully drawn your trackplan on grid paper using a scale of say 1 inch = 1foot, then you will be able to measure the size of platform you need on top of the supporting structure. You may wish to loosely lay out some track on the floor and see if your general plan will fit in the platform measurements you have made. If not, you either have to change the trackplan or the size of the benchwork. Many times, even if you have planned carefully, after the model railroad benchwork is completed and you begin to lay track, you may find that your plans have to be altered in some small way. Or you may have gotten another idea to put a branch line here or there that you hadn’t thought of before. Most of the time however planning everything ahead of time will help you avoid major problems that will require a lot of time to fix. There are some folks who like to just put up the model railroad benchwork in the space that they have and figure out how their general plan will fit onto it afterwards. There’s no rule that says you can’t do this. It is often difficult to visualize a 3D track plan with mountains, rivers, elevations, etc from a 2 dimensional drawing. For many of those people, most of the details of their track planning may occur after the benchwork is completed. Still I think it’s a good idea to at least have an idea about what your general plan is before you start hammering and sawing and then figure out that your entire model railroad benchwork will have to be redone to support your plan. •	Do I want a “loop to loop” configuration? “Point to point”? Both? Do I need a wider area to loop trains around at each end of the layout? •	Do I have a large freight yard or big industry that I need to fit into a certain area? •	Do I want lots of mountains and valleys? •	Do I want one layer, or level, of trains - or 2 or 3 levels? •	Will I need a helix to get trains from one elevation to another? •	How much aisle space do I need? Hint: Don’t skimp on this! •	Will I need an access area – a hole in the middle of the layout – that I can duck into, from under the layout, for train access? This will require forming a "crawlspace" through the model railroad benchwork to get to the opening. •	Does my model railroad benchwork need to be portable? Will I be showing it at model railroad events? Will I be moving to a new residence soon? 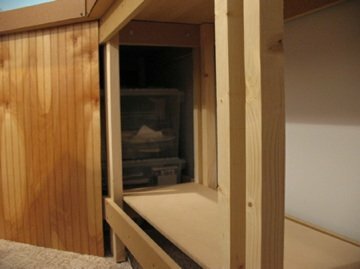 If you’re just getting started in the hobby and you just want a small layout at first, your “benchwork” may consist of a solid 3x6 ft door, or a 4x8 piece of plywood, that you can buy inexpensively at a building store, supported on a folding table or old wooden kitchen table that you were going to replace anyway. (Make sure you get permission from the chief cook and bottle-washer first.) My first model railroad layout was built on top of an old ping-pong table! As you progress in the hobby however you will eventually want to have something more solid to serve as a purposeful foundation for your creation. If you want to “do it right” from the beginning, I would advise starting out with good, solid benchwork. There are detailed books published by Kalmbach on building model railroad benchwork that are worth looking at. I have built my own benchwork from scratch using 2x4’s and plywood without the benefit of reading about it first. It wasn’t that difficult and I am by no means a carpenter, but I wouldn't recommend doing that now. The L-girder method of making strong, supportive benchwork inexpensively was first developed by Linn Westcott and has been very popular in this country. 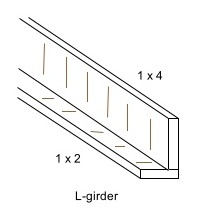 To make an L-girder, you take a 1x4 board and attach the flat side of a 1x2 or larger board as a flange to the one inch side of the 1x4, so that the 2 boards form an L shape when viewed as a cross-section. This creates a beam with considerable strength. 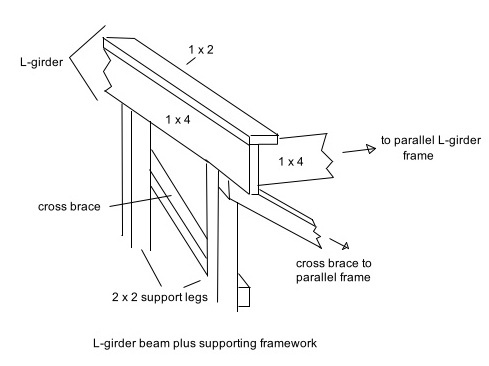 2 of these beams can then be fastened to the top of intermittently spaced supporting structures made with 2x2 legs with cross braces between them. This creates a frame upon which you can then place your subroadbed. If you like lots of hills and valleys, some people recommend a “cookie cutter” method of using a jigsaw on a plywood sheet to cut your elevations out leaving one end still attached to the plywood and elevating the free end of the cutout on wooden blocks. Another way to get lots of irregular terrain is to use an “open grid” of 2x4’s or 2x6’s in rows on top of your framework, and then add 1x4 or 2x4 "risers" attached to the grid in specific locations that would match your trackplan. You can then either use plywood cutouts of your trackplan to put on top of these risers or you can use wood strips spliced together with glue to create curved subroadbed on top of this grid or on the risers. The idea is to then use screening material or a web of cardboard strips covered with plastercloth or plaster-soaked paper towels laid over this grid in an irregular fashion such that hills and valleys are created. There are other ways to do this that I think are simpler and easier. I just mention it here for completeness and so that you know this is one method of doing it if you are not “carpentarily challenged” like I am. After the main supporting structure or frame for the model railroad benchwork is built, I like to use 3/8" to 1/2” thick plywood as a platform on which to build the layout. The plywood should extend a couple of inches beyond the front edge of the support. If you want your layout to be portable, or at least not too difficult to dismantle in case you have to move it later, you should cut plywood sections to fit over the top of each of the underlying benchwork modules. This way, if you disconnect the modules, the overlying plywood will already be able to be separated. The overlying scenery may have to be cut and separated, but this may not be too difficult if most of it is made with layers of foam. If you like, you can use a jigsaw and have nice rounded edges or curves along the front edge of the plywood. 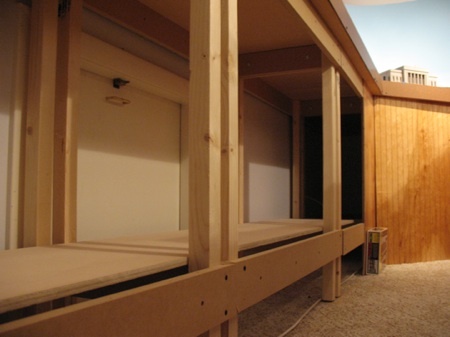 I would also recommend some type of cover for the front of the supporting structure such as paneling or sliding cabinet doors so that you can use the area under the layout for hidden storage. I would also try to use some type of finishing molding around the edge of the plywood to make it look better. A lot of layout builders use homasote on top of the plywood for their subroadbed, or platform, on which the track is laid. Its main disadvantage is the mess it makes with dust getting everywhere, including in your lungs, when you try to cut it. Make sure you wear a protective mask if you work with it. I think a better alternative is to place several sheets of insulating extruded foam that you can purchase in building stores on top of the plywood and glue them together. Now, if you want to create valleys and rivers or lakes, it is an easy matter to just use a knife to cut the shape of your river or valley out of the foam. If you want to add mountains, you can cut out layers of foam and shape them into whatever type of mountain form that you like. The scenery section of this site will explain more about this and other ways to shape your terrain. Another advantage of using foam sheets for your layout surface is that it is very easy to create channels for wiring - to sectional control panels on your fascia, or straight down to the underside of your layout (although you will need a long drill bit for this). Once your model railroad benchwork is completed, you can then get into the really exciting part of model railroading – laying track! Some like to establish the terrain first and then lay the track across it and around it, just the way we have to do it in real life. I myself prefer to lay the track first, complete with grades and different levels of elevation, then lay the terrain around it. Neither way is right or wrong, just personal preference. *The benchwork kits that I was referring to in this article are the "Mod-U-Rail" kits made by Woodland Scenics. The web page where you can order them is at http://woodlandscenics.woodlandscenics.com/show/category/ModURailSystem. You can just buy the benchwork separately as I did without the module surface kit that goes on top. After you have an idea what configuration you want your layout to be (L-shaped, U-shaped, standalone center table, around the wall with a peninsula, or other), and if you know the measurements of how big you want the layout to be, you can then order whatever combination of the straight, square or corner kits that you need to provide that configuration. They are very easy to put together. Once you build the separate benchwork modules, then you can fasten them together with the provided wingnut-bolts. This provides a very sturdy surface on top of which you can then place the 1/2 inch plywood surface (which you will have to buy, measure and cut yourself or have the lumber supply place cut for you after you give them the measurements). The kits do not come with the plywood surface, so you will have to buy that yourself. I measured and cut the plywood surface so that when it was placed on top of the benchwork, there would be a 2 inch overhang in the front just for cosmetic reasons. As you noticed in the picture, you can use the bottom rungs of the benchwork to place shelves for storage; and you can place sheets of paneling in the front to cover the storage area and to give it a finished look. My paneling is just loosely fitted at present for easy removal to get to the underside of the layout as it's being built, but eventually, I will mount these panels on wooden sliding strips so that they will slide open when I need to get to the storage area underneath the layout. From "Model Railroad Benchwork" to "Homepage"